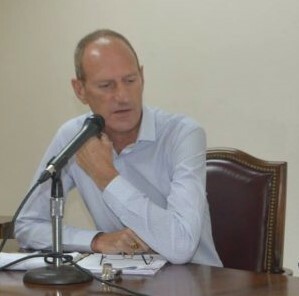 UK Policy Adviser to His Excellency the Governor and Head of the Governor’s office, Tony Bates, and his wife, Colette, will be leaving Montserrat at the end of May, slightly earlier than originally planned (late July). Tony’s early departure is for personal reasons which are not connected to his position in Montserrat. He has been stationed on Montserrat since September 2014, serving under former governors Adrian Davis and Elizabeth Carriere and now H.E. Andy Pearce. Bates, who is an avid photographer and runner, has been quite active in several local organisations. He and his wife have been staunch supporters of the Montserrat Children’s Society, the Montserrat Animal Protection Society, and local beach cleanups. He also started a local photography club to teach his skills to others. Tony’s successor and arrival plans will be announced in due course. This man should have gone a long time ago. BAD NEWS! Do a Google search and you will see.